Get answers to common questions and learn about shopping with Kings Road Merch. Send us a message for additional help. For any further requests please call +49 (0)231-496694-14, or write an e-mail to support@kingsroadmerch.eu or use the contact formular on our webpage. (1) The following General Terms and Conditions of Business (the “Terms and Conditions”) shall govern the contractual relationship between the company Kings Road Merch GmbH, Untere Brinkstr. 66, 44141 Dortmund/Germany and consumers who purchase goods through the Internet shop eu.kingsroadmerch.com and www.kingsroadmerch.eu. (2) Terms and conditions of an entrepreneur that conflict with or deviate from these Terms and Conditions will not be recognized. These Terms and Conditions also include customer information pursuant to the “BGB-Infoverordnung” [German Civil Code – Information Ordinance]. (3) The contractual language is German. (1) The offers on the Internet constitute a non-binding invitation to you to purchase goods. (2) By entering your data and clicking on the “Purchase” button, you make a binding offer to conclude a purchase contract. (3) We have the right to accept your offer within 3 working days by sending an order confirmation by email. If no such confirmation is sent within the period stated in sentence 1, your offer is to be deemed rejected, so that you will no longer be bound by your offer. We store your order and details (e.g. product, price etc.) of the agreement, but you do not have access to your past orders. We will send you our terms and conditions, but you can also view them on our website. If you want to save the product descriptions on our website you can make a screenshot at the time the order is placed or print the whole page. You can correct your entries at any time before sending the order. You will be informed of your correction possibilities during the order process. You can cancel your ordering process anytime by closing the browser window. The object of purchase remains our property until the payment is fulfilled. (1) We are entitled to the full statutory warranty rights. Your warranty claims arising from deficiencies of the good expire one year after passing of risk. -claims due to defects of building materials and structural elements, which were used in accordance to their usual utilization for a building and which caused the building’s defects. Also excluded from the reduction of the limitation is the right of recourse under § 445a, 478 BGB. Statutory limitation periods shall apply for these excluded claims. In case of a given guarantee, the longer period is valid in favor of the customer. We exclude liability for minor negligence and breaches of duty if these do not involve important contractual obligations, damages to life, body or health or claims under the Product Liability Act (ProdHaftG) are affected. The same applies to violations of obligations on the part of our employees and statutory representatives. The contractual obligations include in particular the obligation to deliver the goods and obtain ownership and possession of it to the buyer. Furthermore, we have to hand over the goods to the customer without material defects or defects of title. (1) All disputes arising from or on the basis of these Terms and Conditions shall be governed by German law; the UN Convention on Contracts for the International Sale of Goods shall not apply. (2) Exclusive legal venue for any disputes arising from or in connection with this contractual relationship is this company’s headquarter in case you are a merchant. (3) As far as the contract or these General Terms and Conditions contain regulation gaps or invalid regulations, those legal regulations will be considered valid that would have been agreed upon with respect to the economic goals of the contract and the scope of these General Terms and Conditions, if the escape clauses had been recognized in advance. We do not participate in dispute settlement proceedings before a consumer arbitration board. The withdrawal period will expire after fourteen days from the day on which you acquire, or a third party other than the carrier and indicated by you acquires, physical possession of the goods. To exercise the right of withdrawal, you must inform us, the Kings Road Merch GmbH, Untere Brinkstr. 66, 44141 Dortmund/Germany, Tel. +49 (0)231-496694-0, E-Mail: info@kingsroadmerch.eu of your decision to withdraw from the relevant contract by an unequivocal statement (e.g. a letter sent by regular mail or by E-Mail). For this you may use the withdrawal form you find here, but it is not obligatory. If you withdraw from this contract, we shall reimburse to you all payments received from you, including the costs of delivery (except for the supplementary costs resulting from your choice of a type of delivery other than the least expensive type of standard delivery offered by us), without undue delay and in any event not later than fourteen days from the day on which we are informed about your decision to withdraw from this contract. You shall send back the goods or hand them over to us, without undue delay and in any event not later than fourteen days from the day on which you communicate your withdrawal from this contract to us. The deadline is met if you send back the goods before the period of fourteen days has expired. We reserve the right to retain an indemnity from the price of the good that is returned if, during the withdrawal period, the good has been damaged or has been used beyond what is necessary for your verification of such good. We generally accept payment in advance, payment by PayPal and payment by credit card. For payment by transfer, Kings Road Merch will inform you of the bank account details in the email confirming the order and will dispatch the goods on receipt of payment. Payment must have been received on the Kings Road Merch account within 3 weeks from receipt of the order confirmation. The goods will be dispatched as soon as the amount has been credited to our account. Payment must be made to the Kings Road Merch account within 3 weeks from receipt of the order confirmation. (1) The articles offered by us are originally licensed goods. Depending on the computer screen used by you, colours and colour shades of the articles shown on the screen may differ from those of the original item. (2) Trade marks and brand names shown are the property of their respective owners. (3) All prices include value added tax at the statutory rate but are subject to the addition of delivery costs. The article and delivery costs valid at the time of ordering apply. You will be informed of the delivery costs during the ordering process and here (Terms and Conditions of Delivery). 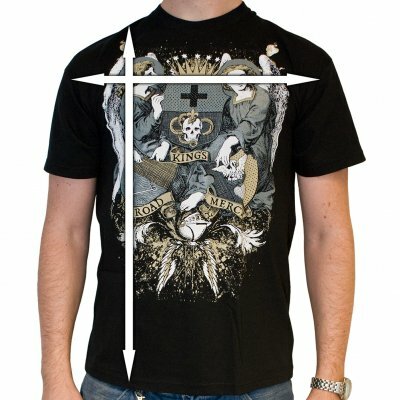 (1) If Kings Road Merch accepts your order, the goods will be delivered as soon as possible. In the case of orders with payment in advance, the goods will only be dispatched on receipt of the full amount by Kings Road Merch. We will not reserve any ordered goods prior to the receipt of payment. (2) If we are unable to deliver ordered goods through no fault of our own, e.g. because one of our suppliers is in breach of its contractual obligations, we shall have the right to cancel the contract with you. In this case, we will inform you immediately that the ordered goods cannot be supplied. Any performance already made by you will be returned immediately. (3) Delivery will be made to the address stated by you. We reserve the right to make part-deliveries, if need be. (4) Before accepting the delivery from the parcel delivery service, please ensure that the package or packages has/have not been opened, damaged or tampered with in any way. Should they have been, you should make a written record to this effect in the handover record presented by the parcel delivery service driver. We ship all products with FedEx, DHL as a secured package or Deutsche Post as a registered mail to avoid any shipping risks . Important: All our orders will be shipped from our warehouse based in Germany. We ship all our DHL packages via GoGreen, this means that DHL donates a small fee per package and invests that money in Climat control projects like rainforest reforestation and alternative energy. The goal is to create more „Co2“ friendly shipping methods. Please notice: In countries outside the EU certain VAT and custom charges may apply. Can you split/combine orders or add/delete an item from a current order? We dispatch your package when all items are available in our warehouse. If your order contains a pre-order, we will ship everything before or on its release-date. If you have placed more orders, we cannot combine them. We also cannot add items to or delete items from your current order. We offer you to cancel and refund them, so you can place a new one with all the items you would like to have. Just write an Email to support@kingsroadmerch.eu so we can do this for you. Pre-orders: How Do They Work? The latin prefix “PRE” means “before” and “order” is the action that you just did. You ORDERED BEFORE the release date. That means, you purchased or are about to purchase a record or sweet, exclusive bundle that has a street date in the future. This means you will not have your order shipped until the week leading up to the release date. This date varies by product and will be on the item description page, and on your order confirmation email. We will not ship until the week leading up to the release date so please be aware of what this date will be. Postage options may prevent you from getting your order exactly on release date, but we will ship ON or BEFORE the release date. Here you can find all info about the sizes of our product separated per brand. PLEASE BEWARE: All measurements are averages. Some sizes may vary. Please use the size chart only as a guideline. Width – With article laying flat and measuring across the chest just under the arms. Height – With article laying flat and measuring from the bottom to the top of the shoulder. We do have a booth at several summer festivals where you can buy our products. You will receive an email when your payment is confirmed. Do you offer wholesale prices to shops and other businesses? Yes, we do! Please contact wholesale@kingsroadmerch.eu for any further information. How do I use discount codes & gift cards? If you want to enter a discount code and/or a gift card code, please click on the items link in your shopping cart. After clicking, you will see a section on that page where you will be able to enter your discount code and/or gift card code. How do I get you to stop emailing me your newsletter? All you have to do is to click on the link at the bottom of one of the newsletters you receive from us and our system will remove you from all future emails. Is ordering from you on the Internet safe and secure? Our shop system is SSL certificated, which means it’s perfectly safe to order from our store. What should I do if my goods were damaged in transit? We take a great deal of care when packing orders to make sure that the items you’ve ordered arrive undamaged, however, occasionally goods do get damaged in transit. If you believe your goods have arrived damaged please contact our customer services team and they’ll help sort you out. What should I do if you've sent me the wrong goods? If you find that we’ve sent you the wrong goods you should fill out the returns form on the back of your delivery note and return the forms and goods to us so that we can exchange it for the correct item for you. If you’ve lost your original delivery note you can print off a downloadable returns form. Please be aware, however, that we are unable to refund items that have clearly been worn, laundered or have been subjected to abnormal usage. What should I do if something from my order is missing? There can be a couple of reasons why you may receive your order with some items missing. The usual reason is that one of the items you ordered was unavailable and so we have refunded you for that item. If you discover that your goods are missing please contact our customer services team and explain the situation. What do I do if the goods I ordered haven't arrived? Please check if you got a note from the mailman. There might be a chance you were not home when your items were delivered. In some cases they will leave your package at your neighbor’s house. A second option would be to check your local post office. They might be holding it for you. If both options didn’t work out, please get in touch with our customer service at support@kingsroadmerch.eu or give us a call on +49(0) 231-496694-0. Our team will be more than happy to help you track the order down. Can the shipping address be different from the billing address? We can ship your order to your working place, a family member etc. Just fill in the address as shipping address. If you want to change your address afterwards, send an email to support@kingsroadmerch.eu with your required address and we will change it for you. Once your order has been shipped from our warehouse an automated email is sent to your email address. Once your payment has been processed, most orders are shipped within 1-2 working days. Once your order has been shipped, it takes 1-2 days to be delivered within Germany, about 1 week to be delivered to other European countries and approximate 3 weeks for all countries outside of Europe. We ship to Europe, UK, North America and several other countries as well. If your country appears in the country dropdown list, we are able to ship to your address. All orders from Kings Road Merch EU will be shipped from our warehouse based in Dortmund (Germany). Why didn't I receive an email confirming my order? Some email accounts like Hotmail, Yahoo and AOL cause email messages from unknown senders to go to the spam folder. Please check your spam folder to see if it ended up there. If the email didn’t end up in your spam folder, there might be a chance you accidently entered your email address wrongly when you registered with us. Please get in touch with our customer service at support@kingsroadmerch.eu or give us a call on +49(0)231-496694-0 if you would like to have this email send to you again. Can I cancel my order after it has been submitted? If you have completed your checkout and wish to cancel your order, please email us at Can I change my order after I have placed it? If you have placed an order and haven’t completed checkout, you can delete the item out of your shopping cart by simply clicking on the box next to the item. Your shopping cart will automatically be updated. What should I do if I have problems placing my order? If you have any problems placing your order, please email us at support@kingsroadmerch.eu or give us a call on +49(0) 231-496694-14. Our customer service team will be more than happy to help you out. We accept the following payment methods: PayPal, Visa, MasterCard and bank transfers. Can I order items that are �Out of Stock�? By clicking on the tick box and sending your enquiry, you consent to the processing of your personal data for the purpose of handling your enquiry. You can withdraw your consent for the processing of your personal data provided by you for your enquiry (by sending an email to info@kingsroadmerch.eu or to the contact details specified in the legal notice). Please check our privacy and our terms of withdrawal.